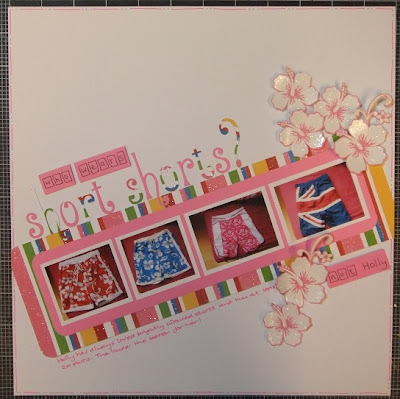 Susibee's Crafty Mess: Who wears short shorts? The challenge on CCW is to use diagonals along side the sketch. At some point Holly has taken a picture of some of her shorts (she probably has about 30 pairs) and I chose these 4 pairs as I thought they went with the papers! What a fun page, Susi. I love your take on the sketch. Such a fun page - love the flowers! !